In a way, I almost wish I hadn't seen this movie. You see, I had Drag Me To Hell pegged as my favourite movie of this calendar year, but having watched Zombieland now, I realize that that top spot is in some hot contention now. We'll have to see how the year pans out, maybe I'll see other movies that will be even better (it seems nearly impossible at this point, but stranger things have happened ie. guilty pleasure -> 13 Going on 30 [I know... I know...]). The beauty of Zombieland is that they keep the plot on the thin side so there isn't too much to think about except to have fun and roll with it. 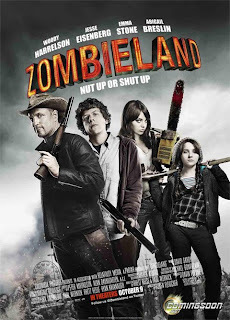 In short, it's just about 4 people trying to survive a post-apocalyptic zombie infested world which they dub "Zombieland". To avoid getting too attached with each other, instead of calling each other names, they go by their home towns; Tallahassee (Woody Harrelson), Columbus (Jesse Eisenberg), Wichita (Emma Stone) and Little Rock (Abigail Breslin). The story is told from the point of view of Columbus, who seems to be more interested in finding love than surviving the pandemic. Throughout the movie, the rules in which he follows to survive are displayed for us the viewers. The movie is basically a string of sequences showing how our heroes kill zombies and go by their day to day lives. My favourite scene in the movie involved a cameo from a certain A-list celebrity who ends up playing himself (that I shall not name in fear of ruining the surprise). I avoided reading the reviews at all cost and was glad I did so because I was not expecting him to show up at all. Anyhow, I howled with laughter in all that he did and with all that would eventually happen. It's truly great stuff. I'm sure much of the inspiration of this movie is from the Zombie Survival Guide by Max Brooks. Just how the rules are played out and explained has the same comedic style to it. If you're a true zombie movie fan then surely you've already read this book, but if you haven't, I implore you to. You never know when some of those tips will come in handy. All the actors really own their roles with Harrelson being the exceptional standout as a trigger happy yokel. This is the second movie I've seen with Eisenberg (the first being Adventureland) and I guess what you see is what you get. He basically plays the exact same dude as in Adventureland, the geeky and awkward hero. I've seen him do the late-night circuit and it seems like the characters he plays in movies are really just an extension of him in real life. If he can make a career out of playing himself, then more power to him. I can't put this movie over enough. There's something for everyone; a lot of comedy and obviously horror, some fun action sequences, a little bit of drama, all that sprinkled with some romance. What more could you want? I realize it's been out for a few weeks already so if you haven't checked it out, CHECK IT OUT! Later geeks! Dead Snow was wicked! As I have my list right now, I've slotted it as my #4 favourite of the year so far.